How would your curriculum change if your default historical subjects were women, rather than men? How would you assess the importance of the agricultural revolution or Athenian democracy? Would property rights and marriage laws edge out professional status and voting rights in classroom discussions about power? How would you construct narratives of long-distance trade, imperial conquest, and industrialization? Do you imagine the core periodization and themes underlying your course would be altered? These are not new sorts of questions. Histories of "everyday people" and subaltern histories challenge traditional narratives, reframing periods, political structures, social categories, and philosophical ideals in myriad ways. Many teachers already work to incorporate these various lenses into their courses. In a similar spirit, the goal of this exercise is not to write men out of the past. Rather, the point is to highlight the way gender already colors every aspect of what we teach in a social studies classroom, from the structure of our units, to the weight we give specific events, to the ways we teach students to think about sources. It illustrates the pervasiveness of a particular sort of generically masculine character as the invisible subject of much classroom (and textbook) discourse. This is especially evident in a World History context, where required curricular content can feel infinite and teaching time is always at a premium. Perhaps the most positive takeaway from this event was the graphic illustration that this is not a zero-sum game, in which one set of students can win only if others lose. Collectively, the talks showed that lessons incorporating gender are useful in the social studies classroom. For example, Beverly Bossler's presentation, "Women in Late Imperial China" imparted a nuanced view of the relationship between Confucian philosophy, personal behavior, and the late imperial state. She used women's experiences as a tool to explain the connection between state power and invididual behavior, to highlight differences between the lives of elites and commoners, and to show ways Han people differentiated themselves from their Manchu conquerors in the Qing dynasty. All of these topics were accessed through questions about how women were expected to behave, how women actually behaved, and how we know the answers to either of those questions. Nothing was sacrificed, a lot was gained. See the resources and video interviews below to help you use gender as a fruitful, important lens in your own courses. Professor Beth Pollard's presentation was titled, "Deliberating Bodies: the Conventus Matronarum and the Senaculum in Severan Rome." She spoke about women’s political influence in Rome. She described instances in which Roman women were directly involved in political processes, despite being unable to vote. She also explained ways that elite women wielded financial and familial resources to exert political influence. Throughout her talk, she detailed ways that modern historians can differentiate between idealized gendered behavior and Roman women’s actual actions. Citizenship was important to ancient Romans, but even during the Republic the vast majority of Romans could not vote, for either legal or geographic reasons. What kinds of political influence did Romans wield, outside of voting? And how can historians see evidence of these other kinds of influence? In her interview, Professor Pollard mentions women’s political leadership in the repeal of the Lex Oppia. She also discusses the life of Julia Domna, of the Severan dynasty and mentions that we know about her life primarily through the writing of Cassius Dio, who was not sympathetic to her. Also, if you're wondering about that scene in Gladiator, here it is. “Polybius on Roman Women and Property” by Suzanne Dixon, to learn more about Roman women’s property rights. “The Early Career of Fulvia” by Charles L. Babcock, to read about how one Roman woman exerted political influence through marriage(s). “Paternal Power in Late Antiquity” by Antti Arjava, to read about the intersection of extensive paternal power and women’s power in Rome. Professor Beverly Bossler's talk, "Women in Late Imperial China," addressed the social mores and laws that shaped women’s lives in late imperial China. Through this method, she sketched a picture of how state-sponsored Confucianism melded with social class and ethnicity within imperial Chinese society. She also addressed questions about what historians can and cannot (yet) determine about the lives of women in China’s imperial past. An introduction to early (Zhou- or Han-era) Confucianism often begins with the Five Relationships, because they integrate the ritualistic, interpersonal, and political aspects of the belief system. Using information about women's lives in late imperial China, what might you add to a description of the duties and privileges associated with each role? Do these five relationships adequately address women’s relationships? In her interview, Professor Bossler refers to wifely fidelity. This is a complex topic with a long history (see more below), but for a quick indication that “chaste widow” was an official title, see this short explanation of memorial arches (paifeng). In reference to the political use of exemplars, she mentions the communist hero, Lei Feng. In the end of her interview, Professor Bossler comments on the topic of foot binding. While images of bound feet are often disturbing to modern eyes, scholar Dorothy Ko reminds us that understanding the practice requires historical analysis, not simply emotional reaction. The period of republican revolutions in Europe and the Americas is often conceived as a period of expanding rights, privileges and opportunities, during which modern conceptions of citizenship and statehood developed. To what extent did Mexico’s republican revolution of 1810 – 1821 create a more equal society? Did the Mexican Revolution of 1910 – 1920 address remaining inequalities? In her interview, Professor Chowning refers to a conflict in the 1850s over the separation of church and state, in which many women participated in politics in support of the Church. This conflict, known as the Reform War (1857 – 1860), fell between the Mexican-American War (1846 – 1848) and the Franco-Mexican War (1861 – 1867). El Cinco de Mayo commemorates the Battle of Puebla against French forces in the latter conflict. Britannica has a helpful overview of the period from Independence through the Mexican Revolution. Viva la Revolución! from the Latin American and Iberian Institute is a full unit curriculum on the Mexican Revolution, with a section dedicated to women’s involvement. It references two video clips, here and here. Despite its centuries-long importance to global trade, European imperialism, and the Islamic world, Indonesia gets remarkably little attention in World History classes. In his presentation, "Muslims and Matriarchs: Gender and Identity Politics in Indonesia," Professor Jeff Hadler provided some important contextual history, before delving into his main topic: the ongoing negotiation between Minangkabau matriarchal traditions and powerful non-indigenous influences, including Islam, Dutch colonialism, and the Cold War. In the early 19th century, Minangkabau traditions, reformist trends in Islam, and European imperialism collided in the Padri War in West Sumatra. About 125 years later, General Suharto and his supporters killed hundreds of thousands of Indonesian communists. How did ideas about appropriate gender roles influence each conflict? What do these examples show about the connections between gender, property, and power? In his interview, Professor Hadler refers to Peggy Sanday’s argument about the meaning of the word matriarchy, which she explains in her book, Women at the Center: Life in a Modern Matriarchy. He also briefly recounts the events of 1965 in reference to a question about women’s political participation. “A Historiography of Violence and the Secular State in Indonesia: Tuanku Imam Bondjol and the Uses of History” by Jeff Hadler, for a detailed explanation of the Padri War. To expand your conversation about gender systems, consider these two articles about another Indonesian gender system, based in Sulawesi. Professor Corrie Decker addressed the complex, multiple meanings of “women’s rights” in East African decolonization and post-colonial states in her talk, “The Currency of ‘Women’s Rights’: Decolonization, Democracy, and Development in East Africa.” She used case studies to illustrate the ways in which context affects women’s path to political activism, why they pursue particular opportunities, and how their efforts are sometimes co-opted or challenged by other political movements. For practical teaching reasons, World History classes often assign simple dates of independence to the dozens of African nation-states that emerged in the mid-twentieth century. In reality their decolonial periods spanned decades. As in any political struggle, disparate groups formed pragmatic local and trans-regional alliances to achieve independence, even as they disagreed about priorities and ultimate goals. In the post-colonial period, diverse activists in countries across the continent continued to seek solutions to problems that remained after (or were caused by) the creation of independent nation-states. How have movements for women’s rights in Kenya and Tanzania exemplified pragmatic alliances and intra-movement disagreements about priorities? How do these disagreements highlight the diversity of views within East African societies, as well as ongoing tensions between former colonizers and African peoples? In her interview, Professor decker mentioned the Aga Khan and his relationship to education in Zanzibar (now part of Tanzania). This relationship continues today through the Aga Khan Development Network. She also referred to Wangari Maathai, the Nobel Prize-winning leader of the Green Belt Movement. Teaching Decolonization beyond the Nation: The Case of West Africa by Mark L. Reeves focuses on West Africa, but addresses relevant questions about the nation-state as the result of decolonial movements. Women and politics around the World: A Comparative History and Survey, Joyce Gelb and Miarin Lief Palley, Eds. Mobilizing Zanzibari Women: The Struggle for Respectability and Self-Reliance in Colonial East Africa by Corrie Decker. In her talk, “Women’s Work: Bringing Modernism into the Everyday,” Professor JoAnn Conrad tackled two related questions. First, she asked why Modernism, as an artistic and intellectual movement is so strongly associated with male artists and thinkers? And second, she asked how did Modernism make the shift from an elite artistic and intellectual movement to being the visual and conceptual vernacular of communities in many parts of the world? Modernism developed in the context of tremendous societal changes: the global conflict of World War I and the advent of mass culture. How did women participate in the community of visual artists we most commonly associate with Modernism today? What roles did women play in popularizing Modernism and why? 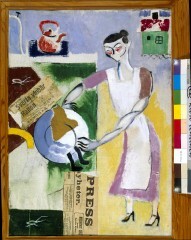 In her interview, Professor Conrad mentions several famous Modernist men, as well as the woman artist, Marie Laurencin. These two descriptions of Laurencin, one from the Tate Museum in London and one from the Schirn in Frankfurt, explain her work while also exemplifying the connection between gender and our understanding of Modernism. Conrad also mentions differences between how Edgar Degas depicted women and ways that women artists depicted them. See Sigrid Hjertén’s The Red Blind and Kitchen, by Greta Hällfors-Sipilä for examples of woman artists depicting woman subjects. JoAnn Conrad’s presentation slide-deck nicely juxtaposed works by married artists and depicted women’s work over the span of their careers. You’ll see (1) how women artists fit into the larger Modernist movement and (2) how woman artists brought modernist aesthetics into mass culture. The Museum of Modern Art in New York breaks down Modernism into its influence on different kinds of painting. The Minneapolis Institute of Art breaks down Modernism into nine different modernist movements. “Postmodernism” entry in the Stanford Encyclopedia of Philosophy. “Post-modernism is the new black” from The Economist. “Modernism in South Asia” by Saurabh Dube describes expressions of modernist thought and art in South Asia. “Modernism in Africa” by Yahia Mahmoud explores the connection between Modernism, ideas of modernity, and modernization. “Modernism in Latin America” by Amy A. Oliver focuses largely on the development of modernist visual and literary movements in Spanish- and Portuguese-speaking Latin America. “Modernism in East Asia” by Christopher Bush addresses types of modernist expression in East Asia and ways that they were influenced by the cultural and political context in which they each developed. “Modernism in the Middle East and Arab World” by Kaveh Tagharobi and Ali Zarei draws connections between successive modernist movements and political developments in the region. The same research encyclopedia has entries on expressions of Modernism in Canada and the US, Burma, Cambodia, and more. Professor Minoo Moallem discussed the complex question of representation in her talk, “Women and the Iranian Revolution of 1979.” How do we represent Iranians and Muslims in our own media, and how does this constrain our understanding of the complex 1979 Revolution? In discussing our representations of Muslim masculinity, veiled women, and our narrative of imperialism she revealed why it is so challenging to teach. At the same time, her questions modeled an effective classroom strategy teachers could use in addressing the topic. Ayatollah Ruhollah Khomeini’s rise to prominence at the end of the Iranian Revolution of 1979, coupled with current American perceptions of Islam and the Middle East, obscure the diversity of views and goals in Revolutionary Iran. Given the variety of viewpoints leading up to 1979, do you think this should be referred to as an Islamic Revolution? Also, what do post-1979 developments reveal about the cultural, religious and political complexity of Iran? In her interview, Professor Moallem refers to Orientalism and Orientalist images of Middle Eastern men and women. Much of her conversation is in reference to our simplified interpretation and representation of the Iranian Revolution of 1979, briefly outlined here. Please see below for more complex background information. Communication, Media, and Popular Culture in Post-revolutionary Iran, by Medhi Semati. This article is part of a series of scholarly, accessible Iran-related analysis at the Middle East Institute. Wikipedia’s “Organizations of the Iranian Revolution” provides a useful list for further reading about the many factions in the Iranian Revolution of 1979. In case you don’t know the difference between the chador and the Shayla, here’s a visual primer on basic “veil” types from BBC News.